At the Clinic for the Rehabilitation of Wildlife, or C.R.O.W., on Sanibel, some birds were reacquainted with the outdoors in a wired enclosure last week. Veterinarian Julia Hill was checking up on them. These are birds that naturally don’t often make a lot of noise. However, these silent birds act as an alarm, signaling that something isn’t right in the environment. Last month, the rehab center got an influx of sick pelicans and cormorants. The birds had gastrointestinal problems, trouble breathing. Some were coughing up blood. Hill said those are symptoms of exposure to red tide. 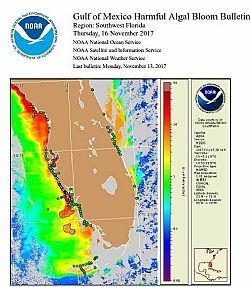 But when these birds started coming in back in October, there were no indications of red tide from satellites or from instruments used to detect it.